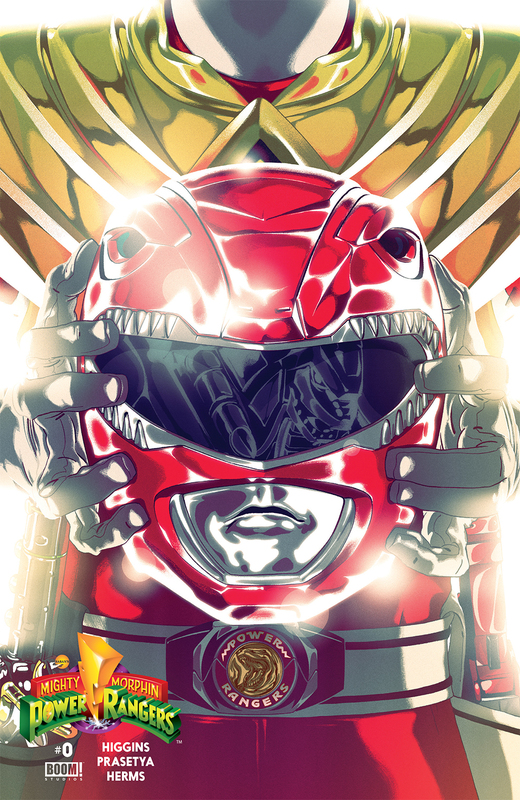 Home›Reviews›Power Rangers - A Look at the Comic Series From Boom! Studios, One Year Later! Starting last year, Boom! 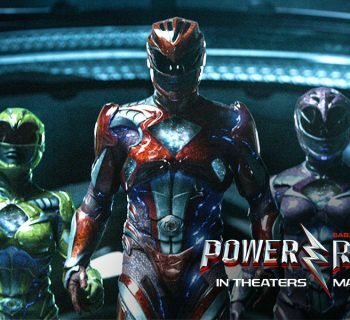 Studios began releasing new Mighty Morphin Power Rangers comic books; this classic children’s action/adventure series has been a hit in many forms over the years, spawning multiple television seasons and spin-off/sequel series, a feature film, and a huge toy line. 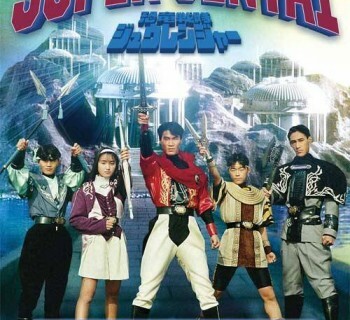 An American adaptation of the Japanese Super Sentai series (which itself has been in continuous existence in Japan since 1975), it has become a cultural phenomenon. Even with all the subsequent Power Rangers television shows and franchises that come about, the original series, which ran for three seasons, is by far the best. 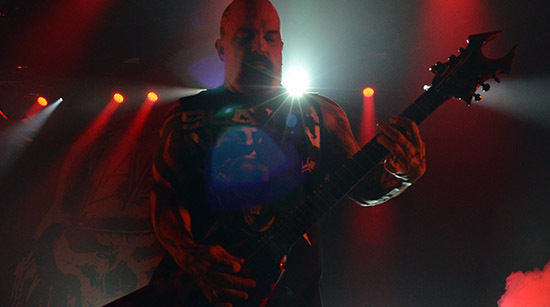 A new reboot feature film is set for release in March (to which Boom! 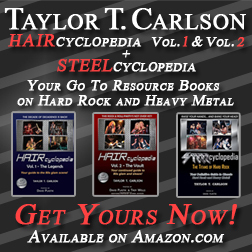 Studios is slated to release a graphic novel sequel as well). 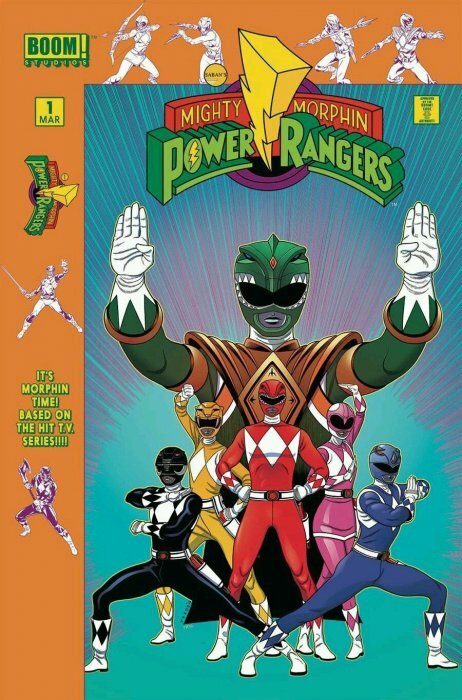 This is not the first time that there have been Power Rangers comic books, but it is the first time that a company has really gotten the license and run with it and been successful. For the past year, Boom! Studios has been releasing comics in two series, the ongoing “Green Ranger: Year One” series intended as something of an interquel between the first part of the television series and the Green Ranger joining the team, and the six-issue “Pink” mini-series, focusing on Kimberly, the original Pink Ranger, on a new adventure after leaving the team to become a professional gymnast. I revisited the Mighty Morphin Power Rangers television series for the first time in many years last year, and while the campy fun, catchy theme song, comic relief (particularly from school bullies Bulk and Skull), and monster designs and action-packed battles appealed to me, the bad acting, terrible plot hole-laden writing, overly child friendly tone, one-dimensional characters, and a number of other elements had not aged too well. While a part of me will always be a fan of the Power Rangers to some degree, the shortcomings of the series a quarter century later really left me doubtful as to whether or not it could work as a comic book. Boom! Studios has not only taken the best elements of Power Rangers and run with them, they have actually made the series BETTER, with a more mature tone, better and more consistent writing, and higher stakes that the television series ever had. Hell, they have even done away with and resolved some of the plot holes of the old TV show! These comic series are not for children; they are for people like me that were kids when the show was originally on the air. There are a few minor changes, namely to characters’ likenesses (likely to avoid having to pay royalties to the original actors) and the time period (technology is updated to match modern times), but at heart, this is still Mighty Morphin Power Rangers as you remember it, with the comic relief and excellent action sequences, and the characters you grew up loving on television. The more mature tone of this comic as opposed to the original television series gives it an edge the original TV show was so desperately lacking, and it is part of what makes this series work so well. The main series, “Green Ranger: Year One,” is set in an essential time period in classic Power Rangers lore, which features Tommy, the formerly evil Green Ranger, coming to terms with being one of the “good guys,” and struggling with visions of Rita Repulsa in his head, trying to regain control and torment him, which impacts him negatively on the battlefield against the forces of evil. But even just as Tommy begins to take control, Rita ups the stakes and the Rangers find themselves against a mysterious dragon from another dimension, which is easily the most powerful foe they have ever battled. But who is behind this menace? 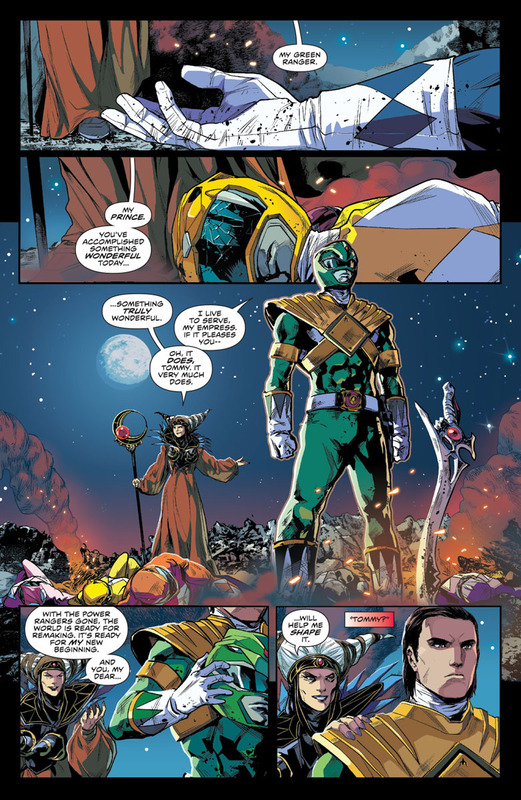 In addition to the “main” story, some of the issues are “side stories” that focus on individual character arcs, including Billy the Blue Ranger struggling with his identity as a hero and if he is worthy to remain a Power Ranger, and one in which Rita tries to turn Zack the Black Ranger into the Green Ranger before recruiting Tommy for the role! The “main” series comic books also include a short “Adventures of Bulk and Skull” segment drawn in a more “cartoony” fashion, which focuses almost exclusively on the stupidity of the eponymous duo getting in trouble around Angel Grove, and even crossing paths with Rita and her monsters! The other main series, “Pink,” is a mini-series focusing on Kimberly after she left the Power Ranger team to become a professional gymnast. Following a gymnastics meet, she heads over to the French town where her mother and stepfather are living, only to find the town is deserted! At the heart of it all is old enemy Goldar, who is transforming the townspeople into mind-controlled monsters, with the help of his head underling, Verto. As if this was not already bad enough, the evil aliens have a new Zord that they can use to wreak havoc on the world. But when Verto takes over the operation with ambitions that exceed his reach, Kimberly discovers she needs to join forces with old and new friends alike, and maybe even Goldar! 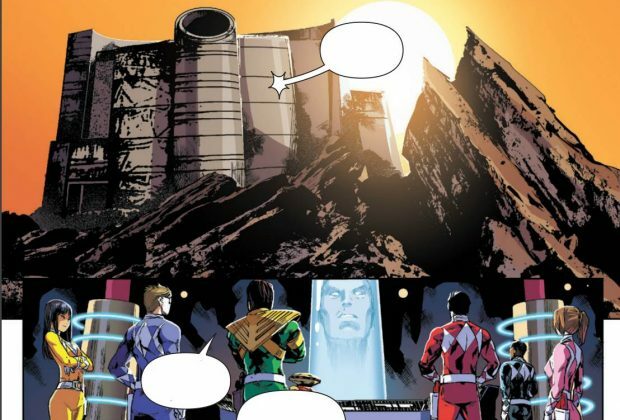 The best thing about these comics is that not only do the writers understand what worked so well about the Power Rangers television series; they also understand what did not, and do away with it for the sake of creating better books. The result is more mature stories that are less campy and not filled with plot holes like the television series, yet they retain the show’s signature feel and sense of humor in places too. These are the characters you remember, and the show explores more depth with these personae, good and evil alike. Hell, the comics even managed to turn Goldar into an interesting, three-dimensional villain! It will be interesting to see how long the main series is going to go on for, and what other series and unexpected surprises the comics may throw our way. In the meantime, if you are an old school Power Rangers fan looking for something to hold you over until the new reboot film comes out, all of Boom! Studios’ releases come highly recommended! All images in this review are the copyright of the original holders/series creators, including (but not limited to) Boom! Studios and Haim Saban/Saban Brands. Alice Cooper (Issue 1)- This Isn't the Archie's Comics!